Supplies: toilet roll recycled, Papers: DCWV-The Christmas Stack(year before last), Stampin Up-Pear Pizzazz, Stamps: Stampin Up-Bells & Boughs, Ink: Stampin Up-Cherry Cobbler, Kiwi Kiss, VersaMark, Stampin Up clear embossing powder, Stampin Up-Pear Pizzazz marker, Sakura Gelly Roll Pen-Silver and White, ribbons unknown, $ Store fibers, Coluzzle tag template, Fiskars shape cutter template-Tags-1, We R Memory Keepers-Ex. Lg. Eyelets, Scor Tape. LOVE the cracker. The colors really work here! 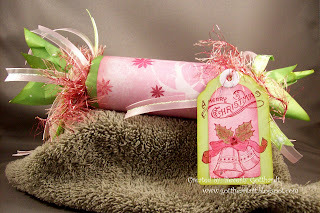 You turned a toilet paper roll into pure holiday magic ... I love that sweet little layered tag ... and those fibers are off-the-charts fun ... fantastic! ... thanks for joining our jingle belle journey. I'm a fiber junkie too! Nothing wrong with a bit of recycling/upcycling! This came out really adorable, I love the fibers too - make the fun colors even more party-ish (it makes sense when I thought it, not so much as I type it) - but it means I like it a lot! Love the colours Beverly and all the sparkle. Trust a man to want you to mention the toilet humour! Your tag just sets this off beautifully. You rocked this color challenge! Amazing work! Hi Beverly, thanks for visiting my blog and leaving me a comment. I got kinda burnt out on the Christmas cards, but I'm loving that pink & green! Great job! I knew there was a reason I was saving those TP rolls - what a wonderful idea. I love how you paired it with your marvelous tag. Very innovative and love the use of recycling things. Awesome! Hi Bev ... finally catching up on my commenting and how glad am I to have made the effort! Your cracker is fabby - love the pink and green and all those funky fibres are just sooooo lush! Thank you for sharing with us at Bah! Humbug!